THE ancient tombs of many of Egypt's most famous rulers, with their treasure-troves of sculptures, paintings, hieroglyphics and carvings, are amazing enough in themselves, but the fact that they were ever discovered in the first place is nothing short of a miracle. Hidden among rocky ravines in a sea of shifting sands on the edge of one of the world's most inhospitable regions, they were first found in the early 1700s in what has become known as the Valley of the Kings, one of Egypt’s major historical centres in a land that appears almost awash with significant temples, monuments and statues. And while finding the great tombs, that were created over a 500 year period between the 11th and 16th centuries BC, was an astonishing feat in such an environment, it was the very nature of the arid climate that helped preserve the great treasures of rulers like Tutankhamun, Ramses the Great and Tutmose III. The descent beneath the desert sands to the hidden tombs, with their sculpted and painted walls telling the story of each ruler, is a stunning surprise for the visitor, with the extreme temperatures in the region and the total lack of rain, wonderful insurance against damaging moisture. Colors of paintings that relate the story of each Pharaoh’s rule and the way of life at the time, are as bold, strong and as vibrant as if done in recent times rather than over 3000 years ago – and even graffiti left by raiding Turks centuries ago remains in perfect condition. And interestingly, while called the Valley of the Kings, its tombs also contain the remains of several of the Pharaoh’s wives, children and related noblemen. Along with the remains of Egypt’s most gigantic temples and monuments in nearby Luxor on the edge of the great River Nile, the Valley of the Kings – that was World Heritage listed in 1979 – represents some of the ancient Egyptians' greatest artistic achievements. Karnak temple with its 60-odd hectares of ancient architecture is probably the most awesome, with parts of it in immaculate condition despite having been built several centuries B.C. And if you think Karnak a wonder in daylight you'll be even more surprised by the spectacular sound and light show that is conducted at the temple around dusk every evening. Strategically placed spotlights see columns and walls silhouetted vibrantly against a cloudless sky, creating one of the world's most remarkable spectacles. As these spotlights track around the temple, the history of the buildings and the manner in which they were constructed over 18 dynasties, lost and then recovered, is narrated over loudspeakers... but be warned that the narration is not in English every night. In Upper Egypt - along with Luxor - the main centres of history are Aswan and Abu Simbel, which are all easily accessible by air, train and road links, but can also be reached at a more relaxed pace by using one of the dozens of cruise ships that ply the Nile between Cairo and Aswan. To permit easy access along the river most vessels have a draught of only a metre or so and generally take a leisurely four or five days to travel from Luxor to Aswan, although shorter or longer trips can be arranged. 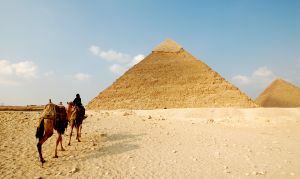 The cruises can be joined as a self-contained package holiday or included in holidays which also offer a few days in Cairo or Alexandria and Aegean or Red Sea beach resorts. While there are frequent air services from Aswan to Cairo a good option is the overnight train that departs Aswan punctually at 5 p.m. each day and offers a superb view of the Nile Valley and wonderful desert sunsets as it races north to the capital. While not to be compared with the Orient Express or South Africa's Blue Train, the Nile train has comfortable sleeping cabins, typically local meals and a licensed club car where the after-dinner entertainment includes an exotic presentation of belly dancing.